Body mechanics refers to the way we move our body. Posture is an important component in body mechanics. Good posture generally means the spine is in a ‘neutral’ or ‘resting’ position. The four normal curves of the spine are natural. This position is not static (fixed) and is individual. A neutral spine is one in which the position is comfortably maintained by the discs, bones, and ligaments. The four curves of the spine are Cervical Lordosis, Thoracic Kyphosis, Lumbar Lordosis and Sacral Kyphosis. 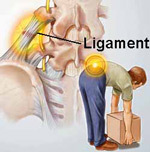 The purpose of this information is to help you minimize injury to your spine. To do this you need to be proactive and learn some basic ‘preventive’ body activities. As we age our spines change. Associated with aging are normal degenerative processes that can affect the vertebrae, facet joints and discs. Trauma, wear and tear, disease and poor body mechanics can alter the structural integrity of the spine. Your spine is a complex arrangement of bones, joints, muscles, ligaments, discs, a spinal cord and nerves. In a healthy spine the vertebrae, facet joints and discs are vertically stacked, held together by a system of ligaments that help support the alignment while allowing movement within a safe range. The discs absorb shock from the changing weight loads applied to the spine from excessive; as well as normal activities such as walking, running, lifting and so on. The spine’s four natural curves also help to evenly distribute these loads, while providing structural support and stability. 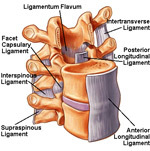 Facet joints and the discs allow the spine to bend and twist. Different muscles coordinate movement in many directions. The brain, spinal cord and nerves, the body’s message delivery system, orchestrates movement. Visualize a plumb line hanging from each ear lobe. In good posture the plumb line will drop straight down from the ear lobe through the shoulder area, down the middle of the arm through the anklebone. Your chin should be slightly tucked, shoulders slightly back and level with the pelvis shifted forward allowing the hips to align with the ankles. Be aware of your posture during daily activities. When experiencing back or neck pain, check your posture. Correcting your posture may help. Good posture should be a part of all activities to minimize harmful stress to the spine. One movement that tends to aggravate back pain, more than others, is bending and twisting simultaneously! Combined, these movements place force on the facet joints and the discs. Some people often bend and twist to pick an object off the floor, reach for the milk in the refrigerator, pull a file out of the cabinet, and so on. Better mechanics would be to face the object and bend at the hips instead of the waist or squat. Keep the back straight. Use your legs and feet to position yourself close to the object to be picked up. Take a moment to think about using body mechanics to prevent injury. Test the weight of the object to be lifted. An easy way to determine if you can lift it without assistance is to try pushing the object with your foot. However, even lightweight objects that are large in size, or cumbersome, may best be handled with assistance. Next, determine what you will do with the object after lifting it. If moving the object to another location, clear obstacles out of the way. Plan the best way to hold or grip the object to keep it close to your body before lifting. Position your body close to, and directly facing, the object. Place your feet flat on the floor, shoulder width apart, to provide a stable base for your body. To turn directions use your feet to pivot. Do not twist! Depending on the shape of the object, try to hold it at the sides and bottom, and close to your body. If possible, keep your elbows bent while carrying an object. Use the muscles in your legs as the power for lifting not the back! Bend the knees, keep the back straight, and lift smoothly. Repeat the same movements for setting the object down. Have you ever watched a golfer pick up a ball or place their tee? The body mechanics they have been taught to use can benefit non-golfers too. This method makes it safer to pick a lightweight object off the floor and come back to a standing position without using the muscles in the low back. The un-weighted leg acts as a counterbalance to the upper body weight reducing the stress to the spine. Reverse the steps to come to a standing position. Many of the same principles of good body mechanics in lifting apply to reaching. You will need to determine the object’s weight and size, its location and planned destination. Don’t hesitate to ask for assistance! Remember the basics: (1) clear obstacles out of the way, (2) get close to the object, (3) face the object, (4) use your legs and feet for proper stable positioning, (5) determine the best way to hold the object, (6) maintain good posture and (7) do not bend and twist simultaneously. If a ladder or stepstool is required to access the object make sure it is stable and adequate to position your body close to the object. Standing on tiptoes places your body in a precarious position! Use one hand for additional support. Avoid body positions that hyperextend the neck such as looking overhead especially for prolonged periods of time. This can cause stress to the spine resulting in pain! Plan how you will store things to make them easy to get to and remove. The heaviest and most frequently used items should be stored at waist height. This can help make it easier to face the object, get close, and pull it toward your body, while maintaining good posture. Lighter and less frequently used items can be stored on higher, or lower, shelves. Consider using more than one canister to hold that five-pound bag of flour. Dividing the weight can make it easier to remove and replace items. Apply this principle in the kitchen, bathroom, closets and garage. Use the strength in the arms and legs when getting on and off the toilet. Bending at the waist while lowering your body places great stress on the spine. Avoid bending and twisting to reach toilet paper. You may need to relocate the toilet paper for safer access. To keep the upper body weight off the spine, keep your back straight. Try placing one hand on the countertop (if close!) and one hand on your thigh. This will help support the spine and body weight. If toileting is difficult it could be because the toilet seat is too low. Try an elevated toilet seat; available at many drug stores and medical supply shops. Most sinks are simply positioned too low! Bending over the sink to brush your teeth is simply unwise. Instead, use one hand to support your body in a more upright position to keep the spine straight. One of the best investments is a good, ergonomically designed, chair! Whether you are working at a desk or watching television the right chair is helpful for good posture, body mechanics and comfort. The way you sit is as important as what you sit on! Position your buttocks at the rear of the seat. If you are short you may need a cushion to fill the gap between your buttocks and the back of the chair seat. When properly seated there should be some space between the back of the knees and the chair seat. Lean your spine against the back of the chair to relax muscles in the spine. If your chair is equipped with a lumbar support adjust it to fit the curve in your low back. A towel rolled up can be used as a lumbar support. Lumbar supports can also be purchased at medical supply shops, specialty stores and over the Internet. Make sure the armrests are positioned to support the weight of your arms. This allows the neck and shoulders to relax. A footrest can help you maintain good posture. Position the footrest so the knees are level with the hip joint. Avoid sitting for prolonged periods of time. Get up, walk and stretch! With the right chair and a few accessories you can make working at a desk ergonomically correct. Work directly facing the desk or computer. The monitor should be at eye level and visible with out turning the head or body. A document holder attached to the side of the monitor can make manuscript-typing neck friendly. An articulating arm can be used to house the keyboard at the correct height for working and can be easily pushed to the side when not needed. If you spend a great deal of time talking on the phone, try using a headset. This will help you avoid cradling the phone between your ear and shoulder. Headsets also allow both hands to be free. Pushing is the correct answer. When you push an object you use the muscles in your legs and back. When pulling some people have the tendency to use their back muscles to yank and pull. It is easier to keep your back straight while pushing. Lean into the object using your body weight to help push the object. There are hundreds of other principles of body mechanics you can incorporate into activities. It would be impossible to list every possible scenario and solution. Consider your posture and how you can make better use of good body mechanics. Your spine specialist or physical therapist will be happy to assist you! 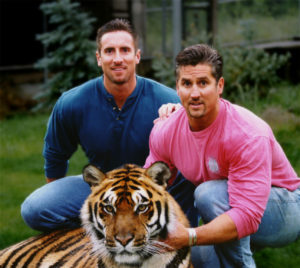 You can find this, and other great Chiropractic Information at www.spineuniverse.com.